Every once in a while I fall victim to package recipes. Like I don't have enough untested recipes from cookbooks, magazines, newspapers and what I find online, right? But sometimes the timing is just right. I opened a newly-purchased container of Stonyfield Farm Organic French Vanilla Yogurt and found a recipe for strawberry muffins on the foil covering under the lid. It was the middle of strawberry season and I had a fresh pint of strawberries on hand, and I've been in a baking frenzy the past few months, so I decided to make them. I must first confess, however, that I am not much of a muffin person. I'm not totally sure what purpose they serve. They're too sweet to serve as a breakfast bread, but not sweet enough for dessert. The muffins that are sold in bakeries and coffee shops are huge, and if I'm going to splurge on something that decadently unhealthy I'm going to go all the way and have a brownie or a lemon bar. But once in a blue moon I get the urge to make them. Every couple of years I will sacrifice some fresh blueberries for a batch. And I do enjoy them once I've made them. And I did enjoy these. They're not too sweet, and they are certainly moist. I think I may have mixed the batter a little too much because they were a little tough, but I can't blame that on the recipe, much as I'd like to. My only criticism of this recipe is that there isn't enough strawberry in it. A cup of chopped fresh strawberries isn't enough to flavor the amount of batter. The next time I make them, I will keep the cup of chopped strawberries, but maybe replace some of the yogurt with pureed strawberries so the flavor will permeate through all of the batter. If you like muffins, you should definitely make these. 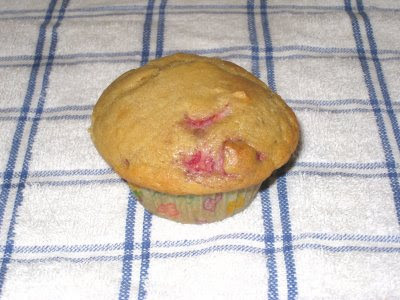 And even if you don't especially like them, these strawberry muffins are pretty good. I will definitely make them again. After I ate a couple, I put the rest in a zippered plastic bag and threw them in the freezer. They held up very well, and I think they might have actually been a little better than when fresh. In a bowl, mix together flour, sugar and baking soda. In another bowl, mix eggs, yogurt, butter and vanila. Toss strawberries into the flour mixture. Then pour yogurt mixture into flour mixture and stir. Spoon batter into greased muffin tin. Bake for 20-25 minutes, or until tops are golden brown.